IT’S HARD TO WINDOW SHOP AT THE WHEN YOU’RE IN A RUSH. If you’re consistently seeing that you’re spending more money on groceries then you’d like to perhaps you’re a busy shopper who needs to back up a step before moving forward. Like a harmless day of retail therapy after work grocery shopping therapy is just as exciting for those who love food. Both of which come with a high price tag if not careful. Do we put enough time and effort into what food we put into our bodies? For the most part I think we buy what we can afford and often go without so we can have something that’s a bit pricey. Those that follow this routine are in-tune with their food expenses and understand the idea behind stretching the food budget. If you have $100 to spend it depends on how many people you are feeding with the $100 and for how long. Those who are shopping for one or even two people at $100 a week every week may be able to afford less for more money. Not everyone wants to get value from their grocery expenses as missed opportunities to save their money are by-passed. As long as they stay with-in their budget and get the items needed they are happy. Why would shoppers want to spend more for less? The only answer I can come up with is, because they can or think they can. A family on the same budget might not have that opportunity to buy less for more. Priorities are different for everyone however I’ve always been the type of guy who likes balance in my life. Saving on groceries to help fund our retirement seems logical for us but maybe not for someone else. Yesterday while picking up some bits for a work function I started to pay close attention to the customers and staff like I always do. Monday mania is what it felt like at the grocery store compared to a relatively peaceful weekday shopping excursion that I’m used to. As a people-watcher it was hard to miss how many people looked like zombies with batteries who were working on caffeine overtime. If you can picture that then you see me most of the time however I do realize that it can cost me more to shop this way. Do I want to? No, but sometimes I don’t have time to surf the grocery store like I would want to. I’d rather just get it over with and move on to what’s more meaningful in my life such as sleep. It seemed like everywhere I turned someone was doing something out of the ordinary and I captured it and sometimes hung around to learn about it. I’ve even questioned if I have done something out of the ordinary that another shopper has noticed. Probably. I’m likely the guy who will answer your questions and won’t tell you that I have to go even though I have other chores to get done. When I grocery shop I’m always thinking about the grocery game challenge and exploring different aspects of the grocery store. I suppose you could call it deconstructing the shopping industry one grocery shop at a time. I find that if I take the time to think about product placement, prices, layout, customers, service and so on that I’m able to see beyond our grocery budget. Essentially it’s my brain education for the food shopping industry. I want to save as much money as possible for our family and bring the readers of this blog any tips I’ve learned along the way. There are at least 2 things that I’ve learned over the years about grocery shopping that will contribute to a pricey food bill. These types of shoppers turn on the “whatever mode” (been there done that). Hardly a savings plan to help you spend less and save more. In the International aisle a lady asked if the price of pumpkin seeds was a good price to her friend across the other side of the aisle. After a brief discussion she puts the seeds back on the shelf.- Detailed Shopper. There were a mixture of busy shoppers and helpful shoppers who didn’t mind stopping to chat about “food” and saving money. Most people I talk to at the grocery store talk about food costs especially the savers who know how to cut costs. I enjoy hearing their savings tips especially from the seniors who have had more time to practice. You know that feeling when you’re pushing the cart as fast you can without mowing anyone to the ground, well that heart-thumping high is a recipe for a grocery savings disaster. I’m sure it’s safe to say that all of us have at one point made a mad dash into the grocery store to get something. The heat is on when you walk through those doors as you begin your mission to get in and get out without a plan or list. That is the best way to spend more money especially if you see something you want but don’t have time to be critical about the item and toss it in the shopping cart. There aren’t many people who I’ve chatted to over my blogging years that have told me that they have no food budget and can spend as much as they need. The majority of Canadian grocery shoppers are interested in the best price because of a tight or limited budget. Even then those that can afford to spend more may opt not too because their budget says so. That’s life. Does a busy shopper want to save money? Likely. Would you open your wallet and toss away $20 bills into the air for fun? Probably not. This is what the busy shopper does when they aren’t prepared for the grocery store. Don’t let this be you. 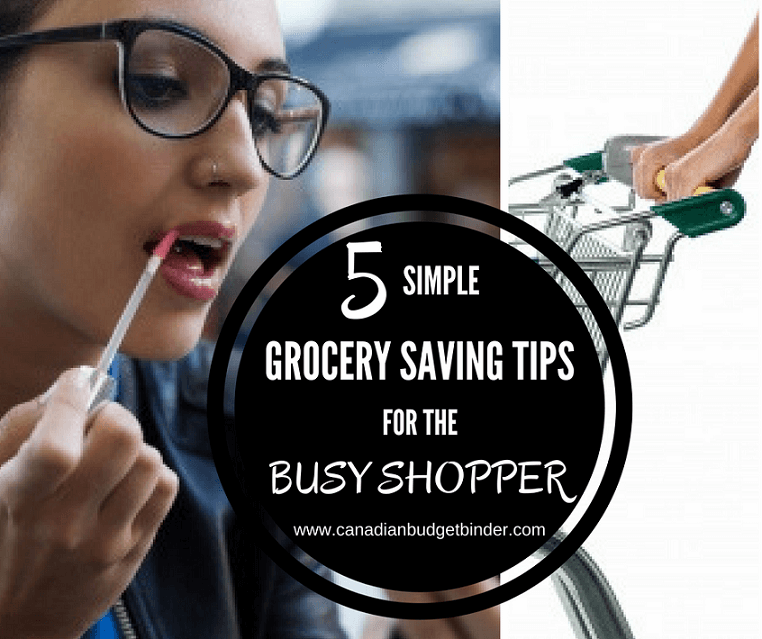 The busy shopper can do a few things to get ahead of their grocery expenses especially if their life is hectic Monday-Friday and they don’t want to weekend shop. Just because your life is always on the go doesn’t mean you have to be the busy shopper who can’t take the time to become the busy shopper who saves. Be proactive about what you REALLY want especially when it comes to your finances, family and friends since they may influence the way you spend and save money. Slow down and take your time when grocery shopping and you will find much value not only for your sanity but the savings. Discussion Question: If you’re a busy shopper who still saves a bundle of money at the grocery store share some of your secrets in the comment section below. NO Shop Week for us. We have more then enough food and drink to carry us over into the next month’s grocery game challenge thankfully as we’re over budget already. Now we have to make up $8.83 in May. Should We Bother Renovating Before Selling Our Home? I’ve been both a “Busy Shopper” and a :Detailed Shopeer” and I agree. Rushing in without a plan, or more often for me it’s getting that call on the way home that we need “that one item” and grabbing many other while I am in the store, costs you more money. I keep various lists utilzing my apps. I always have a list of urgent “we need them now/or very soon” items on Notes in my iphone and another list using Flipp where I tick off what I have, leaving a short list of what I need. I then use the flyer part of the app to get the best deals and make short lists of what stores I need to visit and when (based on my work schedule and proximity to each store). I tend to a lot of shops on different days. I’ve tried meal planning, that doesn’t always work the best for me as my husband does most of the cooking and isn’t much of a planner. I tend to ensure we have the basics at home (meat, rice, pasta, veggies) so he can whip together whatever he feels like that day. I always take leftovers to work for lunches. Kids lunches are more of a challenge, mostly because they can’t take peanut butter to school (Lord! I miss those days), and they are still a tad picky on what they eat. Love your posts Mr. CBB. They keep me focuses on looking for ways to save. Thank you! Overview: Picked up a few items to replenish our supplies but nothing impressive. Looks like you stocked up on some staples this week, good for you. The tuna was a good price. I try to find it around $1.00 max. Do you drive to the grocery store or is there one close to you? I miss those $2 off BBQ sauce for Baby Rays… we got so many free back in the day. Well done. You get ballot #11. Mr.CBB. Yeah, they were mainly staples. I drive to any grocery store that I go to. Wal-Mart was close to the market so it was close and easy to go on my way home after I was done. Ah ok… I thought for some reason you were in walking distance to the grocery stores as well. I’d be broke if I were Christine living across the street lol.. I have a few bucks left this month, $2.57 to be precise, so I am doing a happy dance as I once again transfer those leftover funds into our US Reserve. This is a NO SHOP WEEK on the both sides of the border, for the second week in a row! This week we’re eating up three pots of soup, making some homemade oriental dishes (Egg Foo Yung and an Asian Coleslaw Stir Fry with vermicelli noodles) and since we have a celebration lunch for my MIL to attend…it’s a perfect excuse to pick up our favorite Szechuan Green Beans while we are in North Vancouver. I had planned a little shop in the US but it was pouring rain. Who wants to be loading groceries into the car in pouring rain? Not me, that’s for sure! OUR CURRENT TOTAL UNUSED RESERVES ARE $1,340.30. This means the $1,274.44 that we carried forward from 2016 PLUS AN ADDITIONAL $441.89 that we have added in 2017, LESS $376.03 that we have drawn out for use in 2017. That Grocery Game Happy Dance.. ya! I love the dishes you were making this week. Did all go as planned? I’d love to create a new coleslaw this summer. What are some of your go-to slaws? Here’s to another fabulous month of shopping. Can you believe half the year is around the corner? You get ballot #10. Mr.CBB Happy Shopping! I had to wait until this week to make my slaws…we still had too many leftovers to work our way thru. Nice problem right? I have a jazzy stainless steel mandoline so any vegetable or fruit are fair game when it comes to making slaws. I am actually making a Macaroni Coleslaw this week as well.